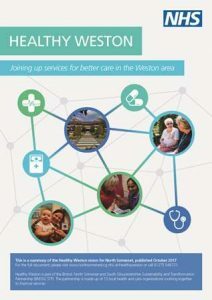 Come and hear about how the local NHS are progressing plans to improve health and care services in Weston-super-Mare and the surrounding area to better meet the changing needs of our communities. Local doctors and health leaders will be talking about the way services, including those at Weston General Hospital, could be delivered in the future and they want your feedback to help us develop the best solutions. This is part of an on-going conversation with local people and there will be other opportunities to give your views over the coming weeks and months if you can’t attend.